As we prepare for Issue 7, enjoy this guest page courtesy of our friend Wide Mouth Ink! As we prepare for issue 7, we’ll be posting exclusive updates and sneak peeks on the Miss Melee Patreon! Check it out! Maybe Jan should get Jackie tested for steroids!? …Stop it, brain. Don’t be envious of a comic character. Start working out instead. Come on. 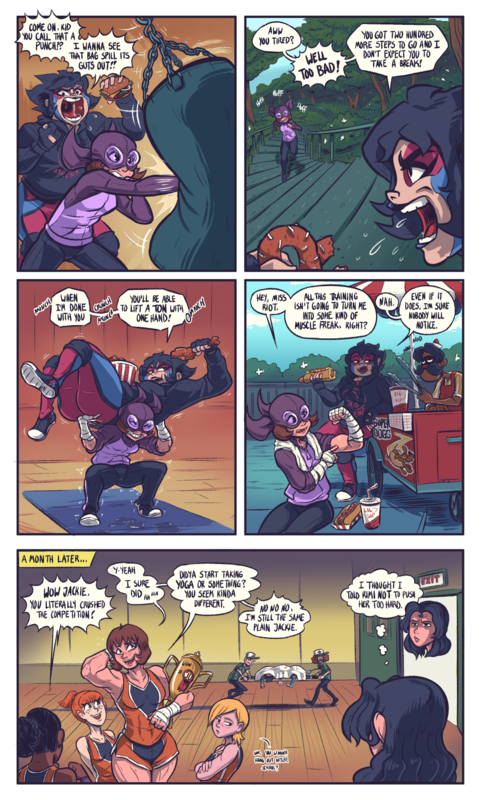 Naturally, in the grand traditions of superhero comics everywhere, no-one notices the increase of Jackie’s muscle density, the boost of her stamina or her ability to swat school bullies with her little finger. Naturally, there is no question whatsoever of linking it to the sudden ability upgrade enjoyed by ‘Kid Melee’. Please see “The Sunnydale Syndrome” for more details. I hope Osakan Riot remembers that Jackie’s got her gymnastics workload too and doesn’t over work her. On a related note, when did they introduce physical contact in gymnastics? They didn’t. I think that Jackie, unused to her new body dimensions, literally fell on her opponent, squashing them like a spider and thus winning by default (opponent unable to compete due to multiple serious fractures). Jackie won by default, all she did was shake hands with the other competitors. ’cause she suddenly looks like she’s 21 instead of a ‘young teen’. Well, naturally. When Riot is telling you to hit things all day long, you don’t question it when she commands you to hit puberty. You mean the kinda strawberry blonde asking to hang out? Yeah, I think she’s kawaii also. You only gain mass if you eat a lot of mass, if you do not eat a lot of mass you won’t gain mass. It’s not rocket science. You’ll still get stronger, untill you hit the max strength for the mass you’re at.